Bryan Seeley, an MLB senior vice president, left, speaks before a legislative committee on sports betting. Behind him is NBA attorney Dan Spillane. 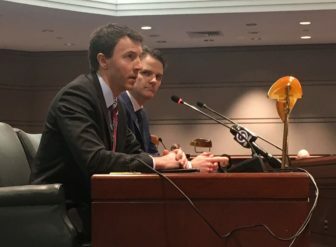 Representatives from the NBA and Major League Baseball (MLB) told Connecticut lawmakers Thursday if they and other legislators across the country develop a sports betting industry, it will come at a price. During a legislative forum on present and future gaming trends, the two officials said their leagues would seek an “integrity fee” of 1 percent of all bets placed. The hearing came one day after House Democratic leaders said they will be preparing legislation ahead of a U.S. Supreme Court decision this summer that may allow sports betting nationally. House Speaker Joe Aresimowicz, D-Berlin, said lawmakers haven’t developed all the details, but are looking at a system that might provide several legalized gambling options. Sports betting is currently illegal in most states, excluding activity grandfathered in Nevada and some narrow exceptions in a few other states. NBA attorney Dan Spillane said the fee would cover the leagues’ costs for investigators who can monitor for suspicious betting and manipulation, and further analytical tools. But Spillane was clear the fee wasn’t for operating expenses alone. “Sports betting is built on our games, on our product, on the interest in our product that is generated by the leagues. Sports leagues invest billions of dollars into staging these competitions, in terms of generating fan engagement and in terms of generally protecting the integrity of our sports,” Spillane said. Public Safety and Security Committee Co-chair Joe Verrengia, D-West-Hartford, said the estimated value of a legalized sports betting market would be about $200 billon. He noted the hearing was the first time MLB has testified publicly on sports gambling. Verrengia said he was supportive of the fee if it would protect the integrity of the industry. “What I’m not for, quite frankly, is legislation that in some way, shape or form would line the pockets of, whether it’s Major League Baseball or NBA, or any other major league sports’ owners,” Verrengia said. Seeley testified earlier in the hearing that direct collaboration between MLB investigators and bookmakers would be important in identifying problems and protecting the game. The major league sports officials also stated they supported a potential federal statute because it could provide uniformity across states. Les Bernal, the national director of Stop Predatory Gambling, urged the committee not to pursue the legislation and said it would financially harm thousands of their constituents. Rep. Danny S. Rovero, D-Killingly, said he was against gambling and voted against most of its expansion. “But the people in my district when I go back, they don’t turn around and say ‘thank you for that vote,’ and I think that’s one of the problems. I’ll agree with everything you said, but as a legislator it’s pretty hard to go against the people that you represent,” Rovero said.